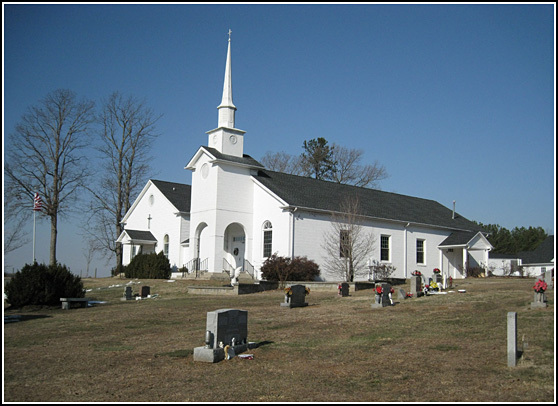 Comments: The Fox Memorial Baptist Church cemetery is located in Fluvanna County about 2.8 miles east of Scottsville on SR VA-6 (West River Road). . The church was organized in 1944 and named for Ryland Fox, who donated the land and was a member of the church. In September 2017, this church cemetery contained approximately 36 gravestones. Directions to Fox Memorial Baptist Church Cemetery from the Scottsville Museum: Head East on Main Street (Rt. 6) for approximately 0.4 miles. Turn left on Fluvanna St/VA-6 South. Continue on VA-6 for approximately 2.4 miles. Turn left and the church sits on a rise near the Scottsville VFW Post 8169. The first listing of extant gravestones in Fox Memorial Cemetery was prepared by Edna Nees of Scottsville, VA. Connie Geary added updates to this listing in September 2017 as shown below.